Quick! Check out my Etsy Treasury! Staying up ridiculously late last night just surfing around, I found myself looking at Etsy Treasuries when one opened up -- so I signed up and quickly surfed around for some seed beadwork from various Etsy sellers. September 11 Bead Quilt Still Moving! 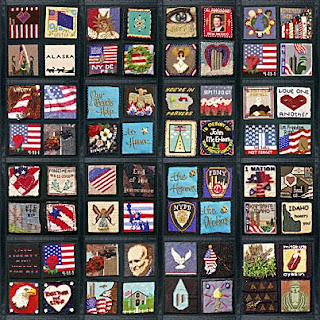 I just heard from Andrea Adams, coordinator of the Bead Quilt September 11 Memorial Project that she will be travelling with the quilt again this year to NYC for the Sept 11th conference hosted by Voices of September 11th ( http://www.voicesofsept11.org/ ), and will be meeting with officials from the WTC Memorial Museum to continue discussions regarding donating the quilt panels. This is a grassroots project supported by individual contributions, and Dre has done an outstanding job (also kudos to Rosa Meyer her right hand woman and crate builder extraordinnaire) keeping things together until the various memorials and museums are built, open, and our projects can be housed permanently in them. and/or email me for the bead quilt Paypal address if you would like to give a donation. You can click on a square and zoom in closer and closer, it's really cool! Thanks for putting up with this blatant soliciation! Foxy Ladies! I made this series for the latest BATC swap on All About Beads (Delphi). I think this is the fourth swap so far -- the only rule (other than size) is that each card has to have at least one bead. I made 8 cards and got a chance to practice one of my 3D sequin flower tricks. Each card is on leopardskin EZ Felt, the next best thing to Lacy's Stiff Stuff (or Rita's Bead Backing, same diff). I also used this series as my August Bead Journal Project and journalled about my new, lusty affair with fancy sequin stitching. After I cut the felt to size, I collaged each piece with a cutout image from my vintage postcard collection. Then I stitched the sequin flower with shameless pink lipstick cupped sequins, and sprinkled just a few acid green metallic seed beads around, in the printed flowers. I backed each card with distressed paper printed with tiny pink polka dots -- not a shabby chic pink but more of an old fashioned rose. The edging is scalloped silver metal tape. Now, this is where the Lacy's product is better than EZ Felt because it's stiffer. Normally when I wrap the edges, I use one continuous piece and turn the corners with a neat little tuck -- but the edges bowed too much so I cut each side to length, and it turned out just as nice, I think, and just as durable. Not sure if I'm quite finished yet -- I might need some words torn from a book...and it's hard to resist embossing a little pattern in the silver tape. Yeah. I think just a wee bit more frufra would do the trick. 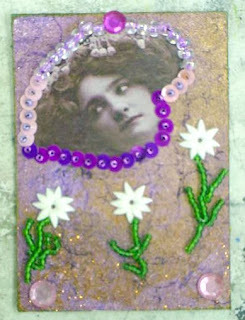 The card above was painted, stamped, collaged and stitched with beads and sequins. 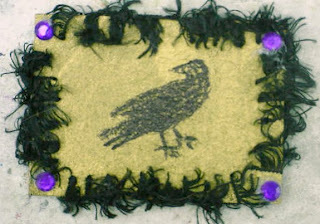 The raven card was painted, stamped, and then the feathery black trim was laced through holes Robin punched in the edges. 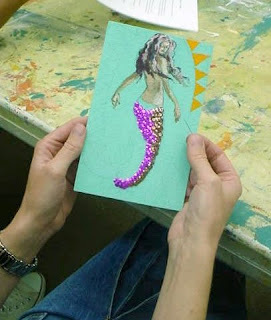 Rosy painted her guadalupana mermaid at home, then brought it to the mixed media beadwork class to learn to stitch on the sequins. Wowee, hard to tell from these photos but the aqua background, cornflower yellow "aura" and brilliant mulberry metallic vintage sequins are rich and vivid. Well here's a blatant plug for ya ;-) I just listed a few of these Sunset Journey necklace kits on Etsy, at a slightly reduced end-of-summer-let's-get-the-kids-in-school-already! price. 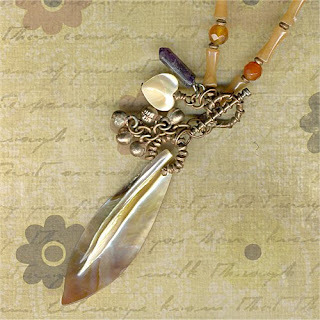 ~~The kit is for copper lovers, for sure~~ it features all-copper findings (and a copper-over-sterling clasp), plus an extra large feather pendant made from mother of pearl, as well as carnelian and red aventurine stone beads. In each kit are special secret goodies to help you customize the project. I have 5 kits left -- 3 are on Etsy and I'm saving the other two for custom orders. ~~The stringing part of this project is at the easy level. To make the charms and such, you'll need a few basic jewelry making tools (listing in the Etsy description). 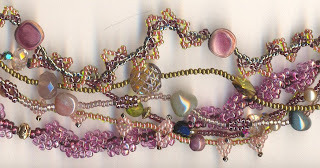 You'll learn a few little tricks for covering bead stringing wire, creating clusters that have great movement, etc. The instructions are simple. 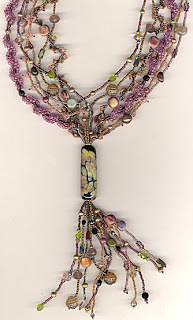 A couple of weekends ago I tortured several members of the New Mexico Bead Society with my Tidepool Necklace project -- an embellished multistrand stringing project with a large focal bead, thus combining very small, medium, and very large beads into one project. So I had stringers, stitchers, and even a couple of valiant beginners in the class, and they all worked very hard (with great results)! Thank you Sandy for sharing these with me and giving permission to share them here, too!